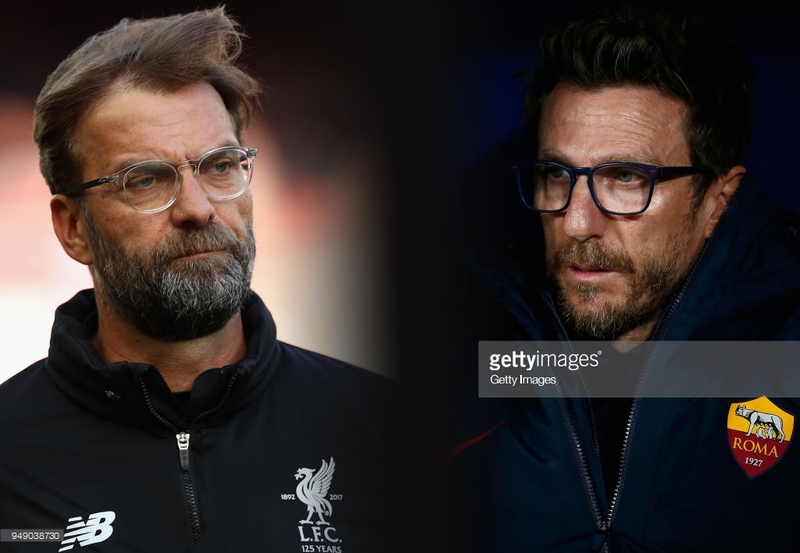 Jürgen Klopp's team hold a commanding 5-2 lead going into Wednesday's semi-final second leg in Rome but can they avoid another Italian job after Eusebio Di Francesco's side inspired a 3-0 home victory against Barcelona. Liverpool travel to the Stadio Olimpico to face AS Roma off the back of a dominant 5-2 victory at Anfield last Tuesday but some familiar lapses of concentration doesn't leave the Reds cruising despite the scoreline. Mohamed Salah produced yet another masterclass against his former-club to score the two openers as well as teeing up Sadio Mané for the third and Roberto Firmino for the fourth. The Brazilian bagged a brace to put the Reds five goals to the good in spectacular fashion. However, a late Edin Dzeko and a Diego Perotti penalty gave the Italian side a glimmer of hope going into the second leg. And Roma need only look to the last round for inspiration - they lost the first leg in Barcelona 4-1 before winning 3-0 at home to progress on away goals in the most spectacular fashion. The Football Writer's Player of the Year the key to reaching the final? The Egyptian winger displayed his greatest performance to date against his former club who opened the scoring off the underside of the bar with a glorious left footed effort before adding another with a delicious chip to leave highly rated Brazillian Allison helpless for both goals. When Salah moved to Anfield last summer for £34m after two years in Rome, nobody could have predicted what would follow. The 25-year-old has scored 43 goals in 48 games for Liverpool - an average of one every 87 minutes - and has so far been the difference in this semi-final. The Liverpool forward was also today named the Football Writers' Association Footballer of the Year. The Premier League's top-scorer became the first African winner of the award to add to his Professional Footballers' Association player of the year award in April. The Reds, who have won the famous European Cup five times, were beaten by AC Milan in their last final appearance back in 2007. With no side having gone through from 5-0 down at the end of the first leg in any European competition, Jürgen Klopp will be frustrated they have given Roma that little bit of hope with two very preventable goals. For 80 minutes the Reds were sublime and were showing signs of worthy winners let alone finalists. However, two late goals for the Italian side and their previous Champions League miracle gives the hosts belief that there is still a slender chance. They looked totally out of ideas and hope towards the end, when suddenly Nainggolan's long ball over the top found Dzeko, who eluded Dejan Lovren to smartly control and fire home. It looked like it would just be a consolation, but suddenly it was a new match. Nainggolan, who had been fairly quiet all evening, had a shot from outside the box which Milner handled before Perotti fired a superbly struck penalty into the top corner to inspire potentially another famous Italian job comeback. However, despite the visitors' late double, Liverpool will fancy their chances of being in Kiev for the final on Saturday, 26 May. Zeljko Buvac, nicknamed 'the Brain' by Klopp, temporarily left his role at the Reds for personal reasons yesterday afternoon. Liverpool say Buvac remains an employee at Anfield and his position at the club is not affected by this absence. The Reds assistant boss will be absent from their crucial semi-final second leg but Klopp still believes this won't come as a distraction to his players. Buvac became Klopp's assistant at Mainz in 2001, after the pair decided to go into management together after their playing days. Klopp was appointed Borussia Dortmund boss in 2008 and took his beloved assistant with him. The pair helped the club triumph to back-to-back Bundesliga titles in 2011 and 2012 as well as a Champions League final in 2013 before he again joined up with Klopp, who was appointed as Liverpool manager in October 2015, at Anfield. Liverpool will be without five first-team players for their Champions League semi-final second leg against Roma on Wednesday. Midfielder Alex Oxlade-Chamberlain suffered a season-ending knee injury in their 5-2 home win last Tuesday that also ruled him out of this summers World Cup in Russia. Klopp also confirmed Joe Gomez will be absent from the tie after suffering a knock in Saturday's draw with Stoke. Adam Lallana, Emre Can and Joel Matip are also unavailable but Liverpool have been given a boost as Mané has travelled with the team today. Left-back Alberto Moreno is hoping to gain full fitness after a knock on the weekend and Klopp said he believed his squad was still "pretty complete". "We have 20 players plus three goalkeepers, but a lot of kids are involved and Adam Lallana is here, too. Lallana is in the training squad, but not available for the game", Klopp continued. For Roma winger Diego Perotti who converted that crucial penalty has been left out with an ankle problem and Kevin Strootman has also been ruled out with a knock.